The software platform is designed for online human interaction experiments. Therefore, grouping is a big part of SoPHIE and you are able to choose from different options that suit your requirements. Before making a decision on the actual grouping, the structure of a single groups should be considered. The number of participants in one group and distinct user roles are parameters to think of. While creating a custom session, the amount of groups can be specified as well as a Pregenerated Grouping. If we stay with the example of the trust game mentioned in the Group Structure Tr.1 and Te.1 will be grouped together by default throughout the whole experiment and this is what the default pregenerated grouping does. The random grouping on the other hand generates a new, random grouping for each repetition of each stepgroup. Tr.1 might be grouped with Te.2 in round 1 of the experiment and with Te.6 in round 2. When an individual experiment without group interaction is conducted, no grouping is required and none should be chosen for the pregenerated grouping, as this saves some loading time, which is required for group creation. When an online experiment is conducted on Amazon Mechanical Turk, a pregenerated grouping is not sufficient. Participants might drop out after reading the instructions and the partners they are already grouped with are stuck in the experiment. 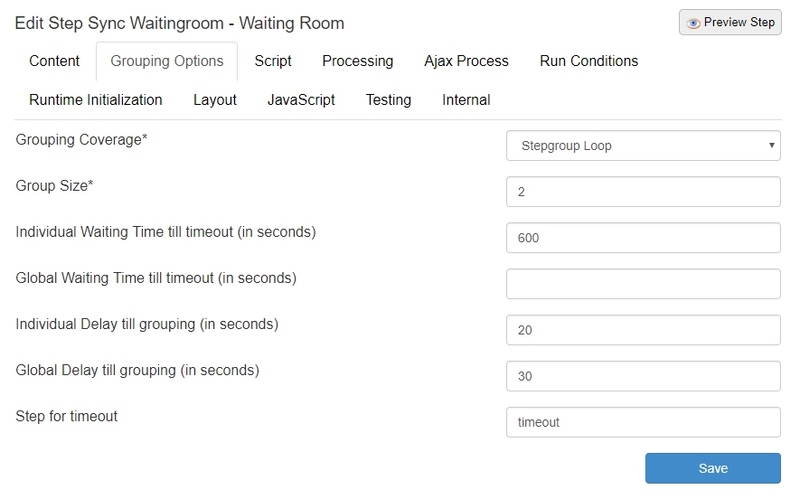 Therefore, we created a Waiting Room, which groups participants right after all individual tasks are completed. This reduces the dropout rate to a minimum. By using this option, participants are waiting a limited amount of time to get matched to another participant. If not enough participants were available to build a group, the other participants drop out after the specified waiting time. You can define the size of the group and the scope of the grouping, as you might want to group participants only for certain tasks before generating new groups. The specifications are shown in the screenshot below. The Waiting Room is part of the SoPHIE Labs Premium Steptypes, please contact us to get further information.